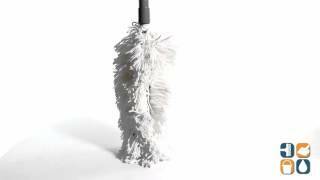 Coming with a straight head that is ideal for those hard to reach areas, Rubbermaid's line of dusting tools are the perfect fit for commercial and residential cleaning. This handle may be extended to clean hard-to-reach areas, this versatile cleaning tool comes with a flexible top that conforms to the shape of virtually any surface. Compatible with Replacement head, RCP T199, sold separately. Gray telescoping handle extends to 51" washable, white dusting head included. Replacement head, RCP T199, sold separately.